Call us on 6180 3899 to make a booking!! Our projectors are some of the newest and best available in Perth for hire! You can connect your computer, TV, HDMI, dvd player, video player or just about any video source to our projectors. Suitable for parties, boardroom meetings, presentations, picture displays, movie nights....just about anything. 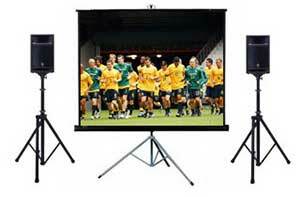 We do offer a delivery and pickup service in the Perth metro hire for all projector and screen hires for an extra charge. When submitting a quote request please select the delivery/pickup option and we will be in touch with a quote. We can also setup your projector for an additional charge. Alternatively you can pickup and drop-off from our stores in Canning Vale & Balcatta for no extra charge. When you pickup the equipment our friendly staff will explain how to use and setup your hire equipment. We have a range of leading brand projectors suitable for the majority of applications. 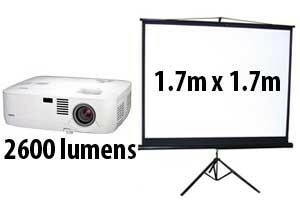 This type of projector is suitable for presentations, product launches, meetings and movie nights. This high output projector is suitable for larger functions as well as where there is sunlight or bright ambient light. Our 5000 ansi lumens projector range features enhanced daylight viewing technology and a very impressive 4000:1 contrast ratio. If you are unsure on which projector to hire, give us a all on 6180 3899 and our friendly staff will be happy to help. Need to keep the projector close to the screen? 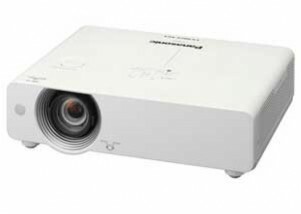 Our short throw projector is perfect for tight spaces including meeting rooms and exhibitions. This projector can project a screen ~2m wide when placed just 0.86m from the screen. Everything you need for a corporate or party presentation. Our standard tripod screen is suitable for the majority of applications. The tripod screen is a 2 piece screen which is made up of the tripod stand and the actual screen. If you hire a standard screen the minimum size will be 1.7m x 1.7m. Recommended for indoor use ONLY for safety reasons. Only $20/night when hired with a projector. Only $45/night when hired with a projector. 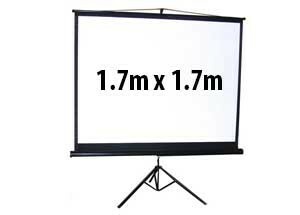 Perfect for outdoor screenings, this versatile inflatable projector screen measures 2.5m diagonal. Inflatable screens must be delivered setup by our team and cannot be picked from our store. Delivery , Pick up and Set up charges are extra . 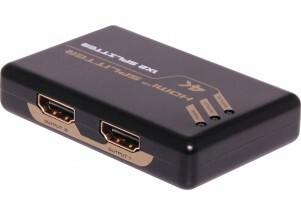 This high quality HDMI splitter allows the connection of a single HDMI source to multiple HDMI enabled projectors. Includes power supply. HDCP compliant. 3D 4K x 2K, 12-bit deep colour and HD lossless audio support. Easy to Install in seconds, no fiddly settings. Full 3D and 4Kx2K resolution. Compatible with compressed audio such as DTS Digital, Dolby Digital (including DTS-HD and Dolby True HD). Projectors have virtually revolutionized conference room presentations and living room entertainment, and made audio-visual equipment a significant contributor to big-screen, video film entertainment and bigger and better business presentations. However, whatever accolades one may shower on today’s state-of-the-art, projection systems, the fact remains that irrespective of which brand or model, projectors can be extremely expensive to purchase. Fortunately, there are a number of companies in Perth, like Hire King, where you’ll find a wide array of the latest options in video projector hire and projector screen hire … all at prices that could keep hundreds of dollars back in your pocket. 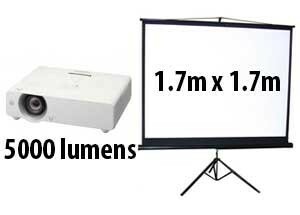 So, whatever may be the projector you’re looking for, make a money-saving decision by visiting any Perth projector hire company, and select a projection system with a matching projector screen hire option from the many available. Whether, you‘re looking for a projector for home entertainment, or to make a big impact and impression for your next presentation, you’ll surely find the most suitable, Perth projector hire and projector screen hire options to meet your needs. Well, the good news is that if you do not have the correct answers, Hire King will provide you with the best technical advice, and assist you in selecting the most ideal projection system to meet your needs … AND very importantly..your budget. However, here’s some advice before you go and hire a projector and projector. 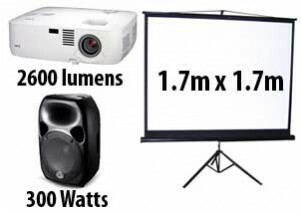 Size of venue – Most Perth projector hire systems are available with small speakers that may not be suitable for your needs, particularly if you are making a presentation in a large conference room, or watching a film in a large public hall or living room. 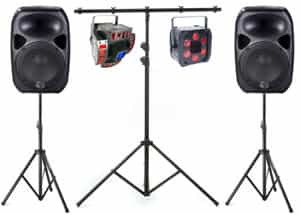 Therefore, it would be advisable to hire a PA system along with the projector hire and projector screen hire option you choose. Size of audience – Provided the room where you intend to watch a film with friends, or make a presentation, is sufficiently illuminated. Remember, the brighter the room, the more lumens power will be needed. 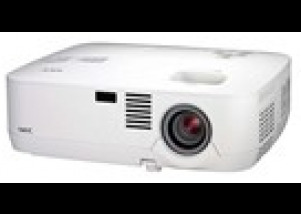 Hire King, like other Perth projector hire companies, have projectors of up to 5,000 lumen power that you may hire, should the need arise. 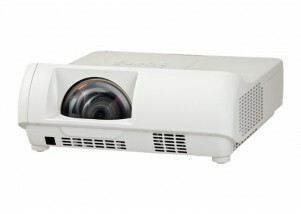 Type of projector – There are several types of projector hire options available. There are standard projector and also short throw projectors. The projector you decide to hire will depend on how far away from the screen you intend to have the projector. If you are unsure about what you require for your projector hire needs please do not hesitate to contact us.